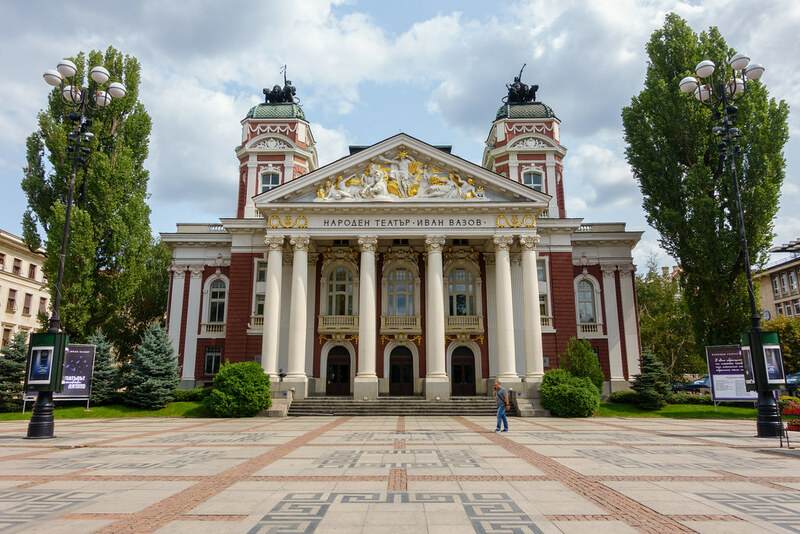 Post 11 of a series detailing our Eastern Europe road trip. View all the posts so far here. Arriving at our airbnb flat, our host advised Steve to park the car in the area across the road as she helped me to carry in our bags. 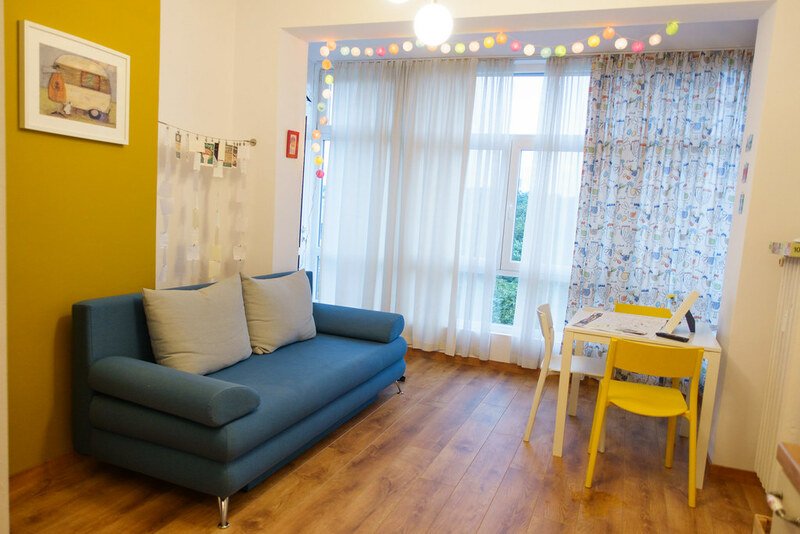 This was another pretty apartment let down by a shonky communist-era lift. 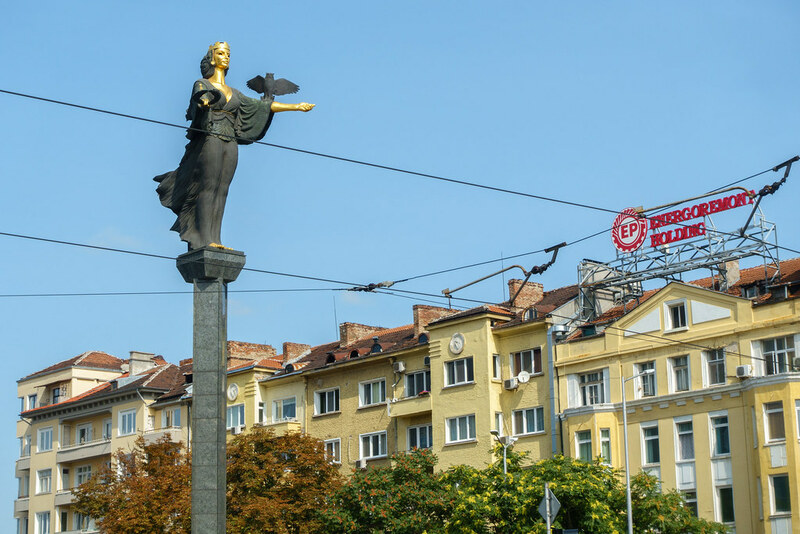 Opposite the National Stadium (Vasil Levski) and around 15 minutes’ walk from the centre, it made a great base. That evening we went out only to buy bread rolls and condiments with which to eat my leftover Pljeskavica from lunch in Belogradchik. 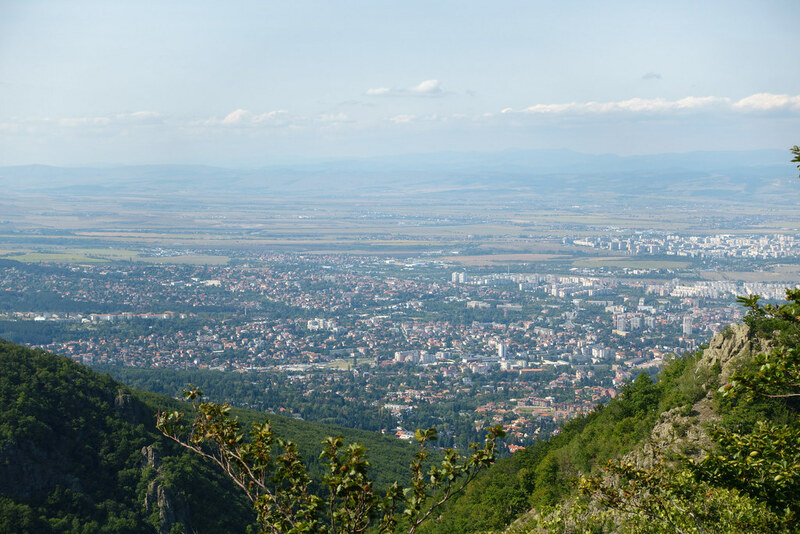 Having searched Tripadvisor for a place we could try the traditional Bulgarian breakfast items of Banitsa – filo pastry layered with cheese – and Mekitsa – deep-fried dough made with yoghurt – we selected a cafe called Daro. Steve had the banitsa, I had the mekitsa, but as the latter was served simply sprinkled with powdered sugar I found it bland. The fresh juices were nice, but it felt more expensive than it should have been. 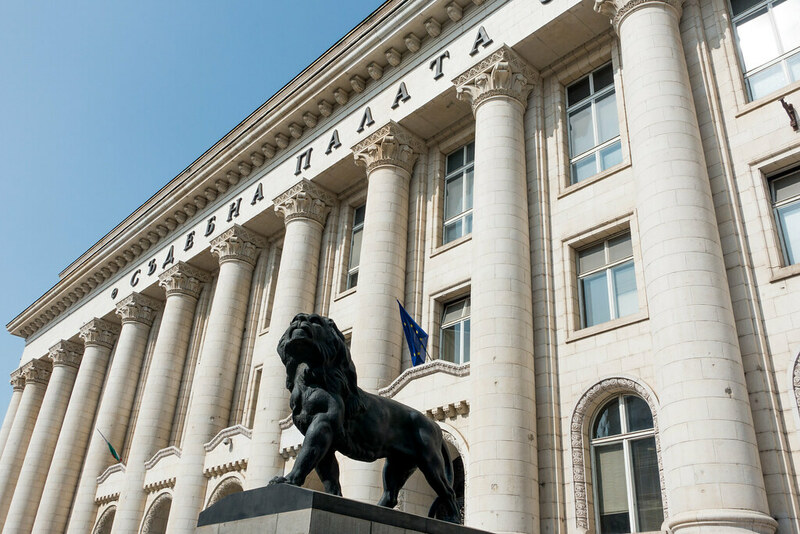 We did a bit of sightseeing around the city’s main high street, Vitosha Boulevard, before boarding the metro to the one tourist attraction that had really caught our eye: the Museum of Socialist Art. 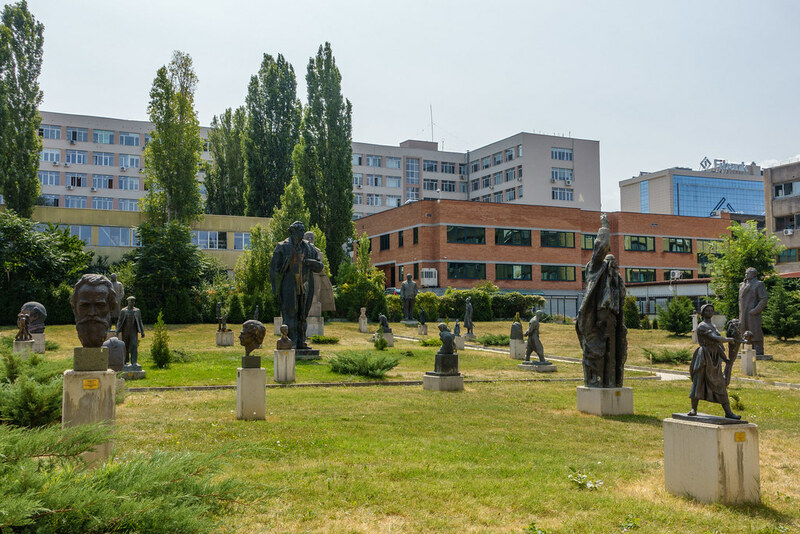 Walking through the iron security gates and into the ‘statue park’ of the Museum of Socialist Art, it felt as if we were somewhere we shouldn’t be. 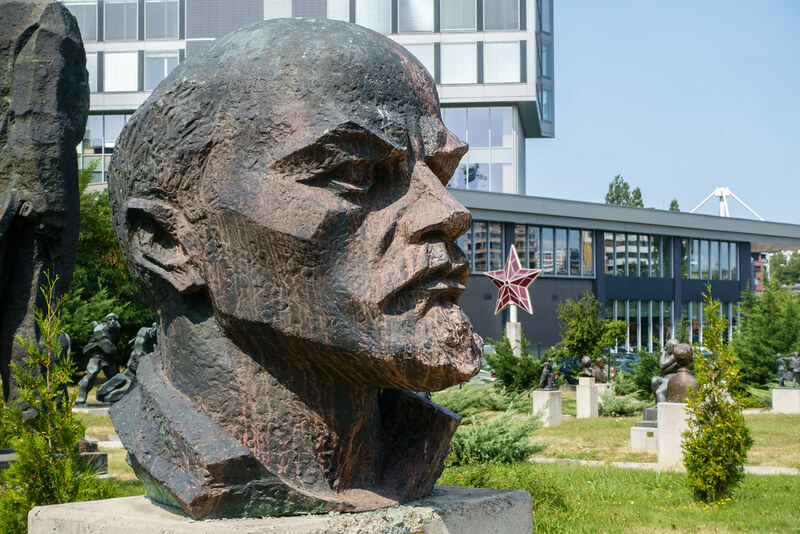 I certainly can’t imagine a garden filled with multiple heroically depicted effigies of Lenin and Stalin existing back home in the UK. But it was certainly eye-opening. Even more eye-opening was the short film we were shown inside, after paying the modest entrance fee. This film showed real communist propaganda and news reels broadcast on Bulgarian TV between 1944 and 1989, and it was intensely interesting, amusing even, in how surreal it seemed. 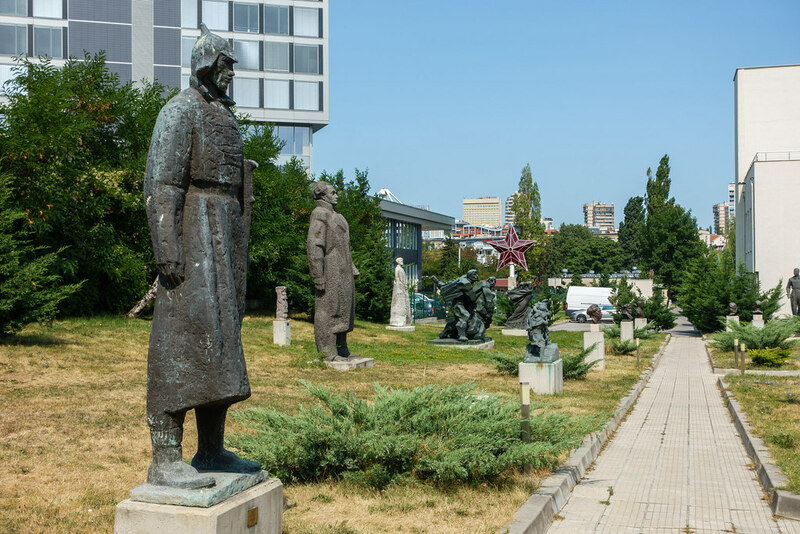 Finally we went to browse the indoor art gallery, which presented a darker and more truthful representation of Bulgaria’s decades of communist rule. The gallery houses some excellent paintings, and plenty of contextual information. I felt that the museum as a whole presented an intriguingly balanced view on socialist thought: one that you would never find in a museum in Western Europe. We both agreed that, despite the museum’s name, its focus is more on communism than socialism. We spent around an hour at the Museum of Socialist Art before returning to the city centre to find lunch. 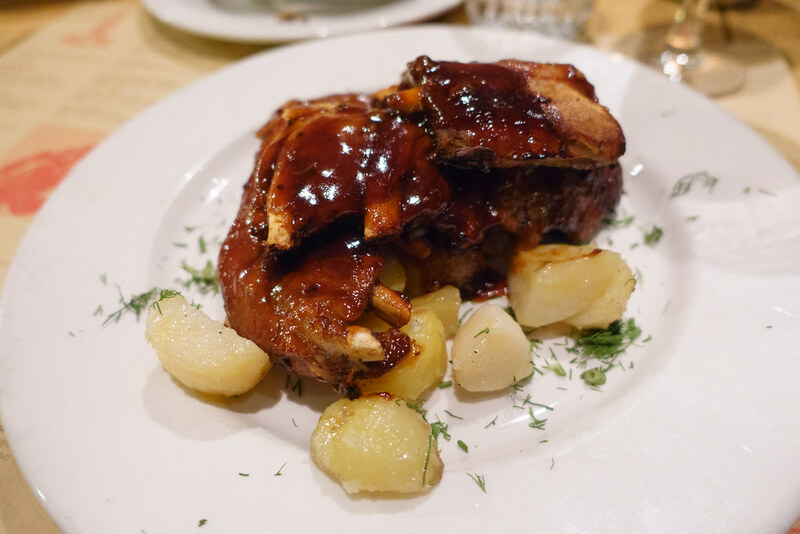 We liked the look and sound of Moma restaurant, located on a side street just off Vitosha Boulevard, and it turned out we couldn’t have picked better. 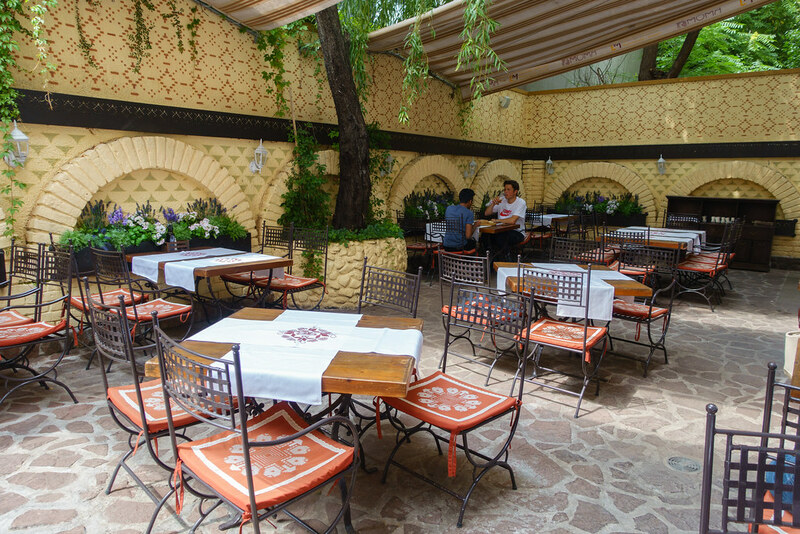 Sat outside in the restaurant’s pretty shaded terrace, our meal began with a complimentary plate of bread with Bulgarian dips: one made with tomato and aubergine, the other creamy and cheesy. 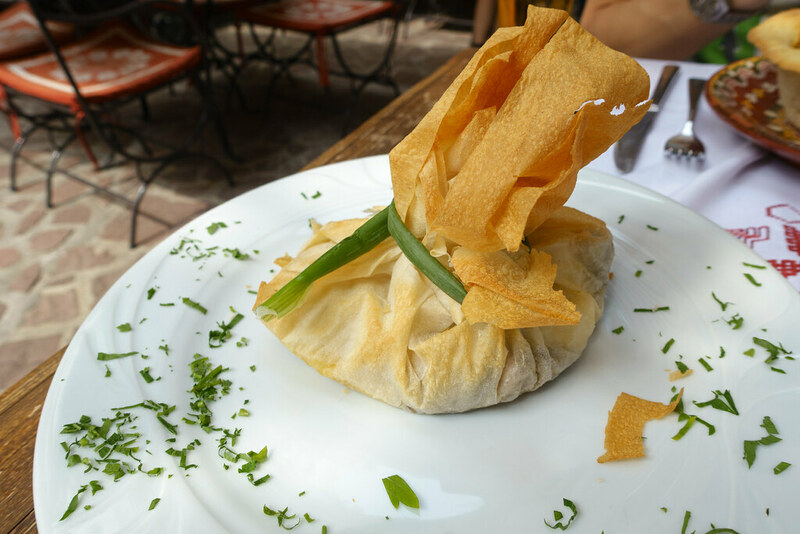 I ordered a dish of chicken, spinach and mushrooms baked in a filo pastry parcel, while Steve ordered a game casserole in a crunchy bread bowl. Both were utterly delicious, as was the Bulgarian rosé I had to drink. 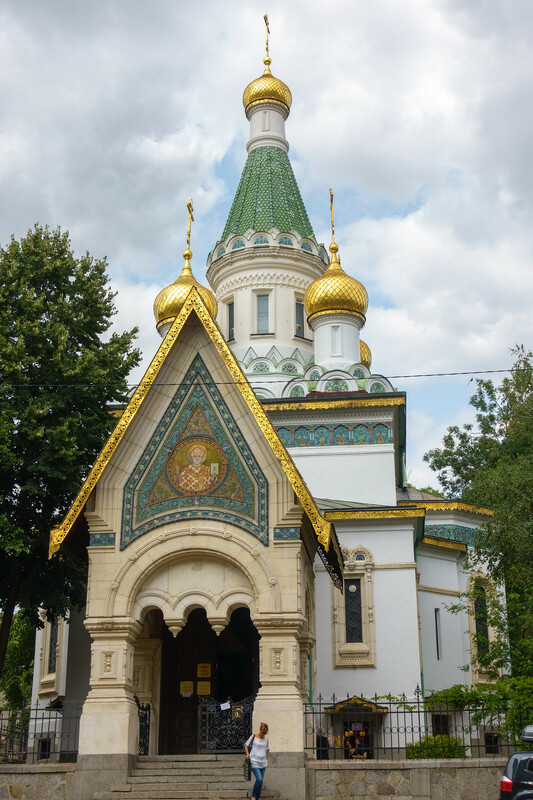 Next on my sightseeing agenda were Sofia’s glorious gilded churches. First up was Saint Nikolas Russian Church (Tsurkva Sveta Nikolai), identifiable by its tall white spires topped with golden onion domes. Inside it’s small and unremarkable, but what’s interesting is the crypt that lies underneath. This holds the marble tomb of Saint Serafim, where people leave notes on which they’ve written wishes. You’re not allowed to take photos inside. 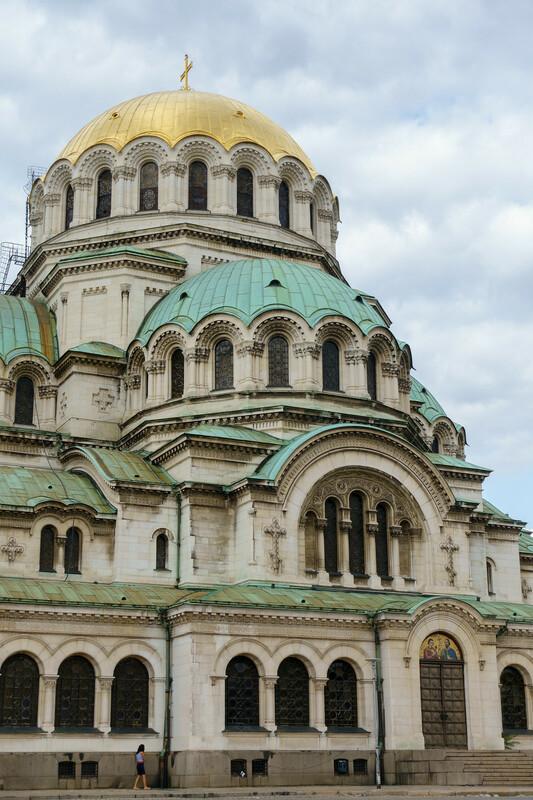 The most distinctive of Sofia’s religious buildings is Cathedral Saint Alexandar Nevski, whose stacked green and gold domes have made it iconic. We made do with taking some photos from the outside (it costs 10 lev to take one inside) before going to buy breakfast and lunch supplies for the following day. Our intention was to return to the flat to relax before dinner, but we went to check on the car first – only to find that it wasn’t there. It dawned on us that Steve had parked it in the paid parking zone without realising it, and hadn’t paid. Icy dread flooded my veins as I concluded it had probably been towed. We rushed back to the flat and began frantically googling and making phone calls. No-one who picked up the phone seemed to speak English, and Steve was continually being passed around and hung up on. After several attempts someone finally confirmed that our car had been towed and impounded, although we still weren’t sure where. I found the likeliest candidate on Google Maps and we hailed down a taxi to take us. The taxi driver gave us a further fright by taking us to where he thought the pound was then exclaiming that it had gone. Thankfully, when I realised we weren’t at the one I’d pointed out and directed us to that instead, there it was. We left in our car 10 minutes later, around £40 poorer. Oddly, the whole car escapade left us feeling more relaxed than before. 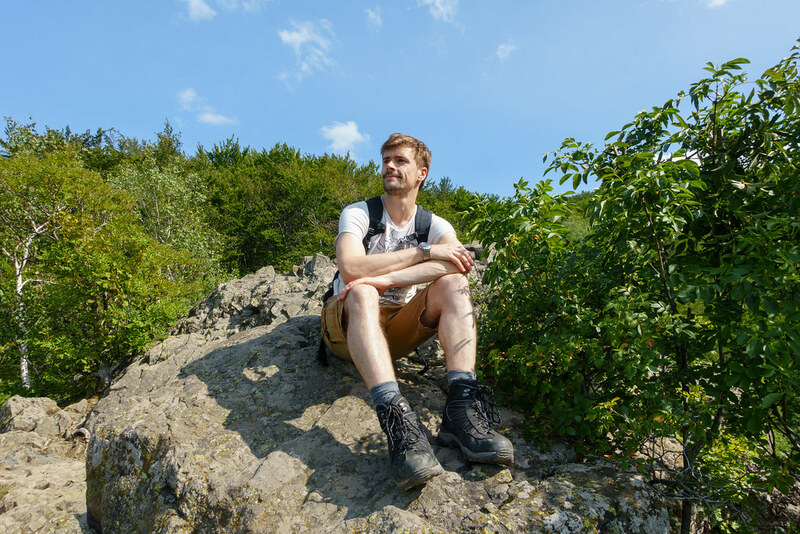 The relief of getting the car back – and feeling that we’d surmounted the worst mishap that was probably going to happen – allowed us to see the humour in the situation, and we set off for dinner in high spirits. 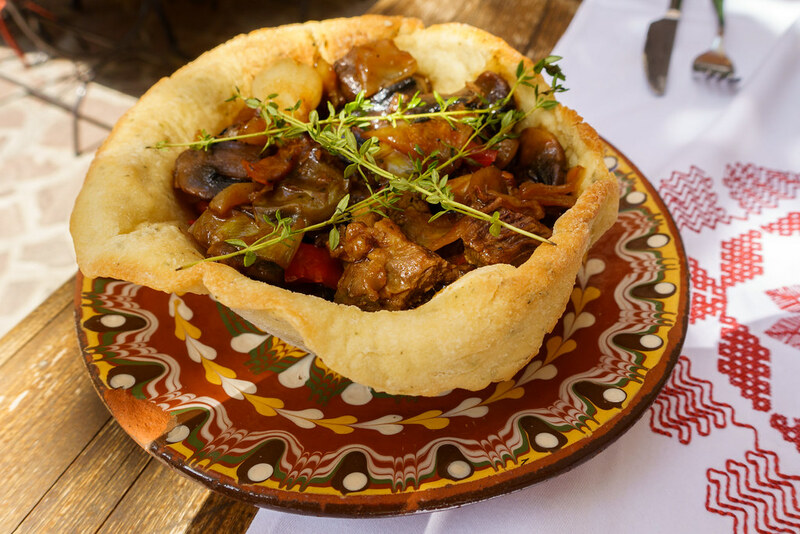 This made Raketa Rakia the perfect choice for dinner that night. 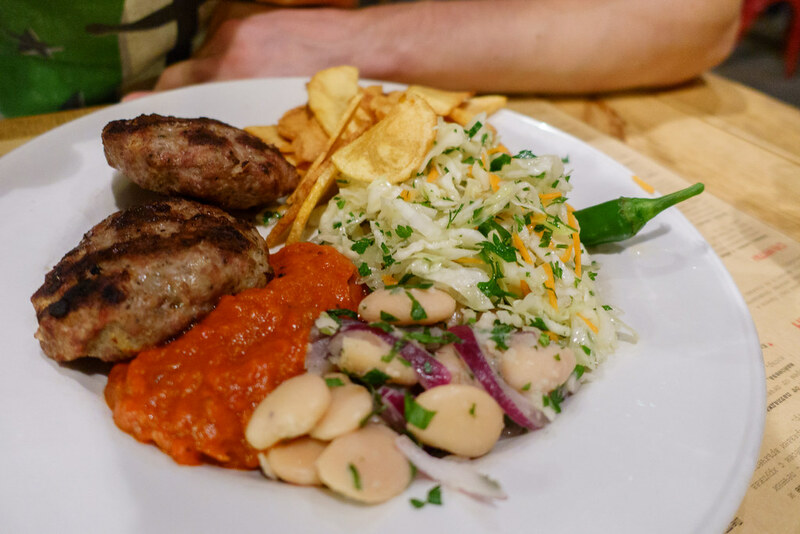 This communism-themed bar and restaurant offered a lively atmosphere, a long menu of traditional yet modern Bulgarian cuisine, and an even longer menu of rakia: Bulgaria’s national spirit. 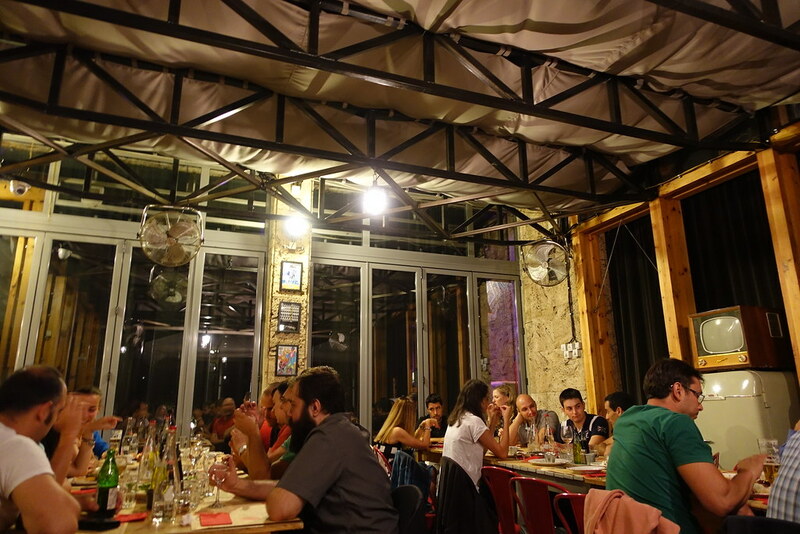 We each gulped down a firey shot of rakia (beware, it is VERY strong!) before moving onto our standard beer and wine. I ordered the honey pork ribs and these came in the most amazing sweet and sticky sauce. Steve had deep-fried lamb brain to start (I wasn’t a fan!) and meatballs for his main. It was a fantastic meal that our waiter made even better by bringing us free shots of honey rakia, which he did with us! 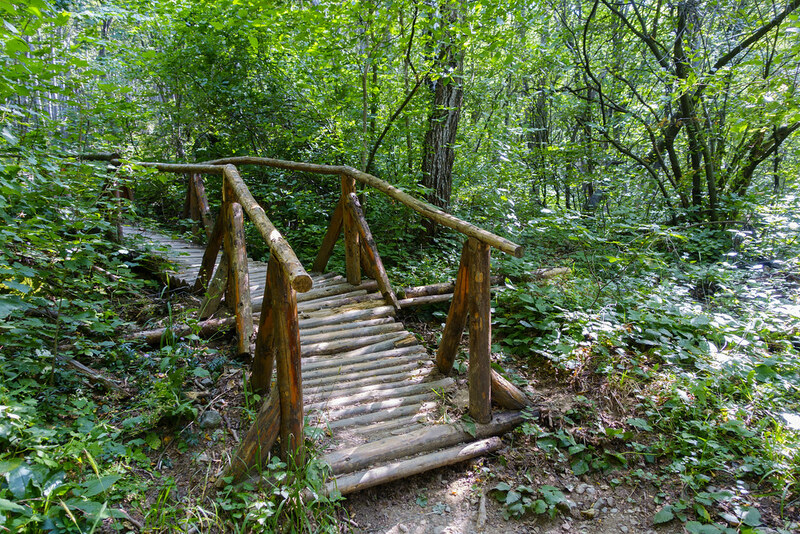 The following morning we went to find a bus to Boyana Church, which was trickier than we expected. Following Google’s advice we caught a bus to the bus station, where it told us we could get the 107 bus to Boyana Church. When we found the stop, however, a man standing there told us the 107 wasn’t running. When it continued not to show, we decided to catch the 64 instead. This took us nearby but still required a considerable uphill walk to reach the church. 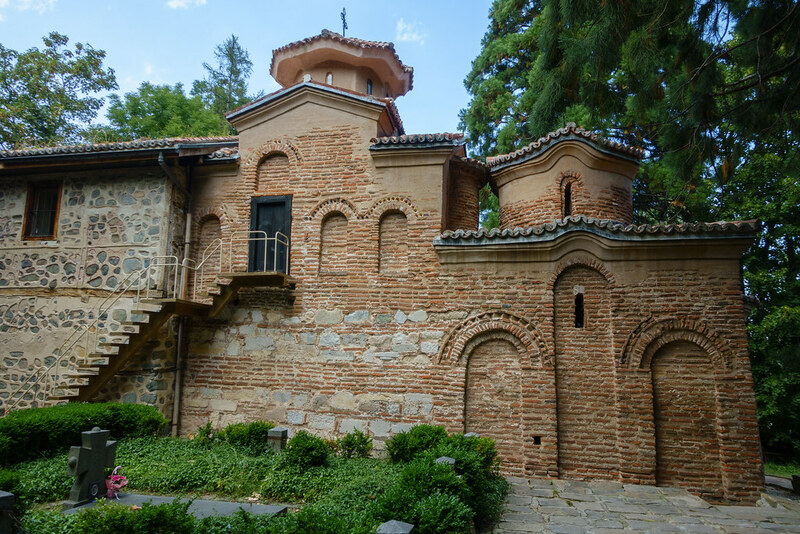 Boyana Church is a UNESCO World Heritage site and dates back as far as the 10th century. It is famous for the frescoes coating its interior walls, which date back as far as the 11th century. These can only be seen with a guide. We paid the fee to be shown inside but I don’t think it was worth it – there’s not much to see, and unless you pay more for commentary it’s just a load of faded religious paintings! Unsurprisingly, it’s also prohibited to take photos inside. 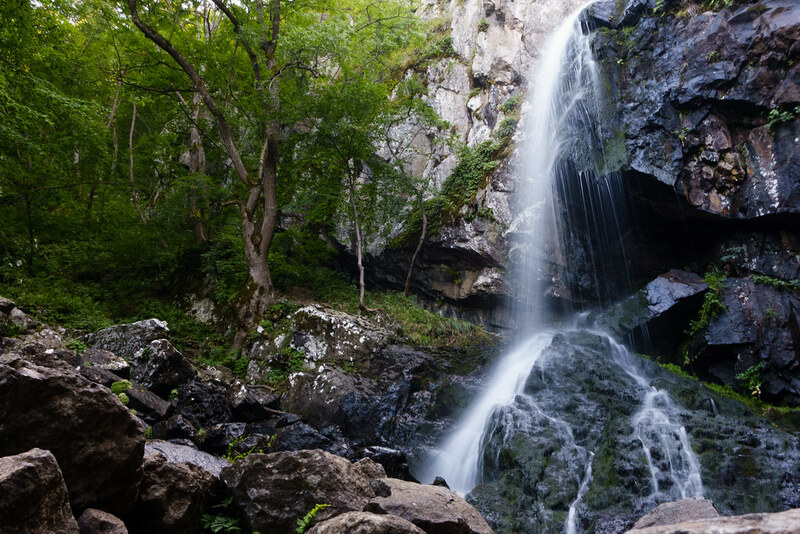 But the main reason we came up here was to walk to Boyana Waterfall on Vitosha Mountain. 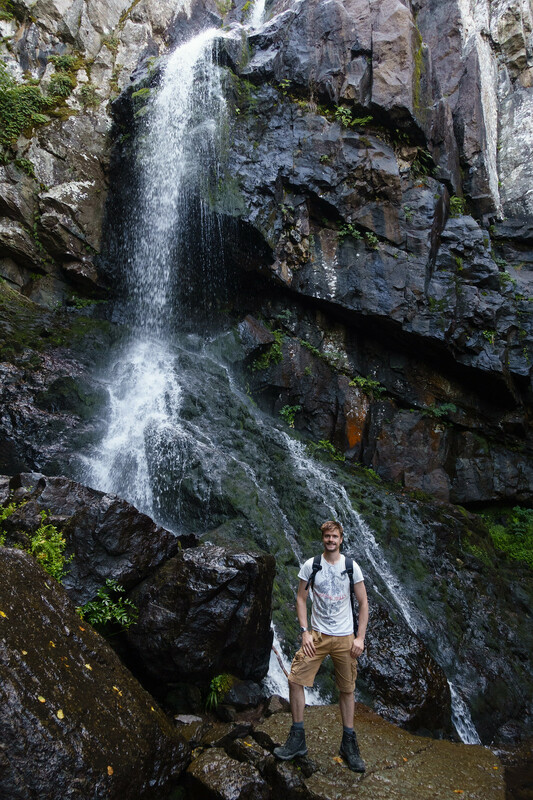 Unlike the church, both the walk and the waterfall lived up to the hype. The trek was long but really enjoyable thanks to the mild weather and comfortable uphill gradient. About halfway up we stopped at a brilliant viewpoint for looking over the city. We heard the water crashing over the rocks a while before we saw it. 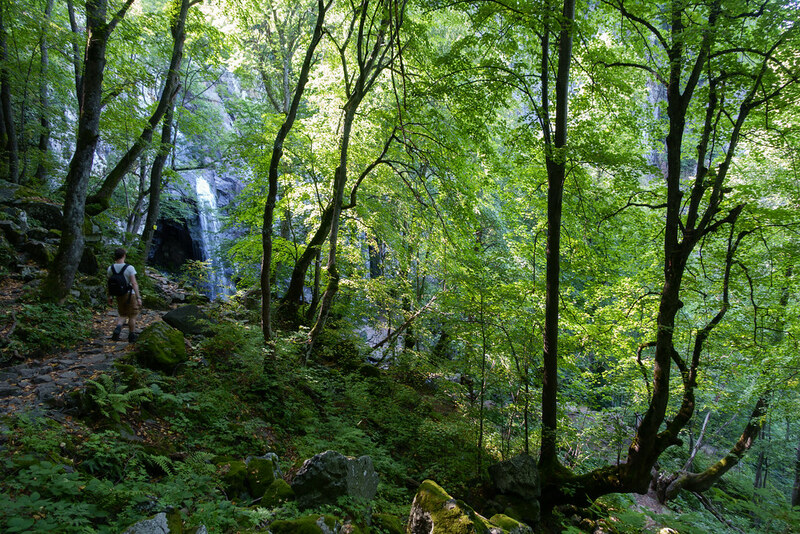 When we finally emerged into the waterfall’s leafy glen, we were so happy we’d made the trip. 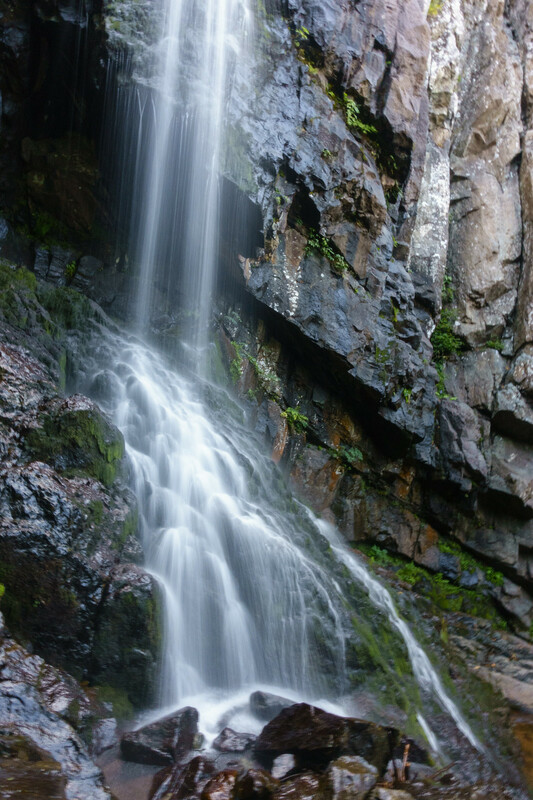 Although not very big, the waterfall looks and sounds really impressive with its multiple cascades over shining black rocks. We spent a considerable time relaxing in the glen’s dappled shade and taking photos before heading back down. 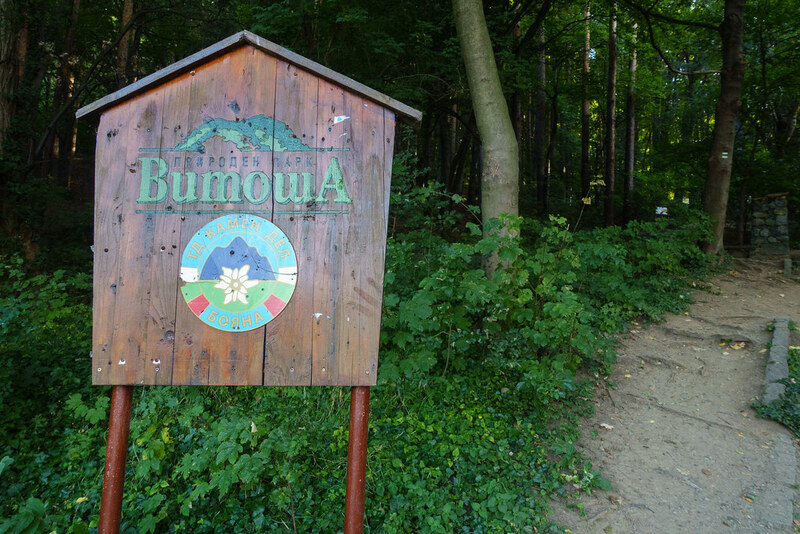 We meant to go back via Boyana Lake, but we must have taken a wrong turning somewhere as we were back at the walk’s beginning before we knew it. 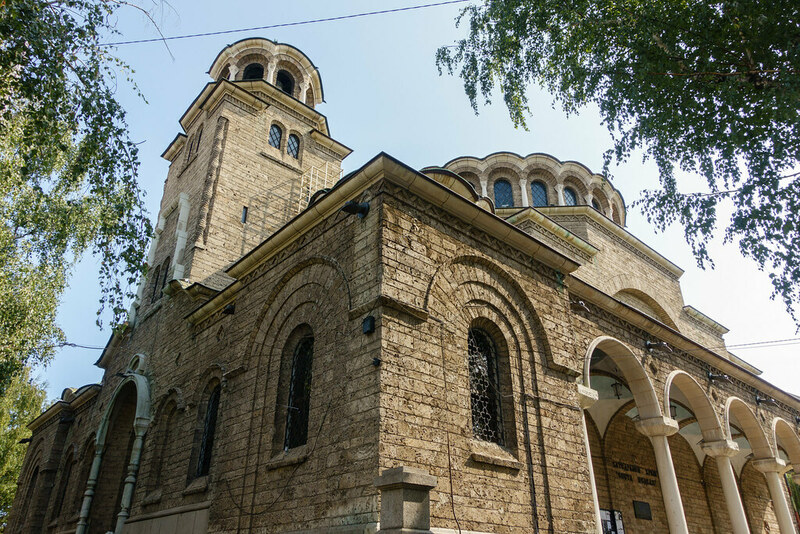 Returning to Boyana church, we saw a 107 bus – so they had been running all along. We caught it back to town and returned home to freshen up, before heading out for dinner. Cosmos is one of Sofia’s fancier restaurants, however, because this is Bulgaria, our meal still came to no more than we’d pay for a standard meal out in Edinburgh. 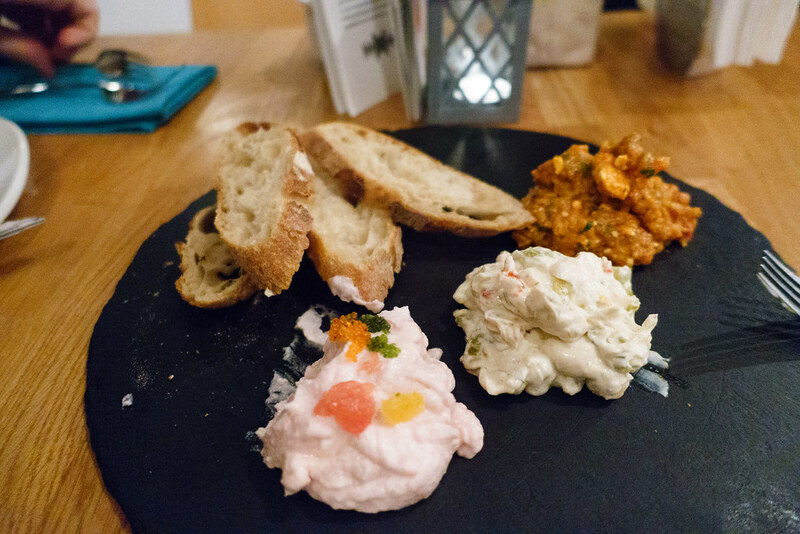 We shared the Bulgarian bread and dips platter to start, which was similar to the one at Moma only much more intensely flavoured and smokier, and came with an extra dip (lemon-flavoured with caviar). Cocktails are a speciality at Cosmos – so much so, that the menu suggests food and cocktail pairings. I ordered a fruity one called ‘Red Planet’ to complement my duck main dish, and it was delicious. 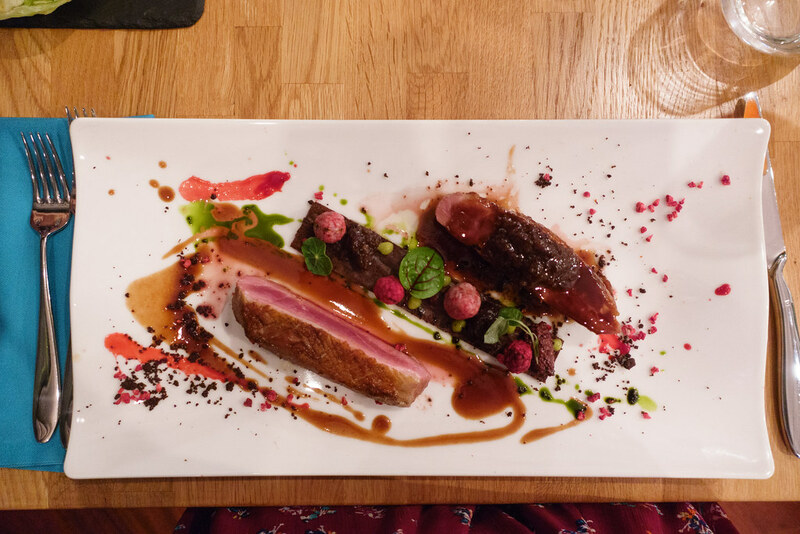 The dish itself, called Duck Magret, was incredible: juicy chunks of seared duck accompanied by chocolate, raspberries and yuzu drops. 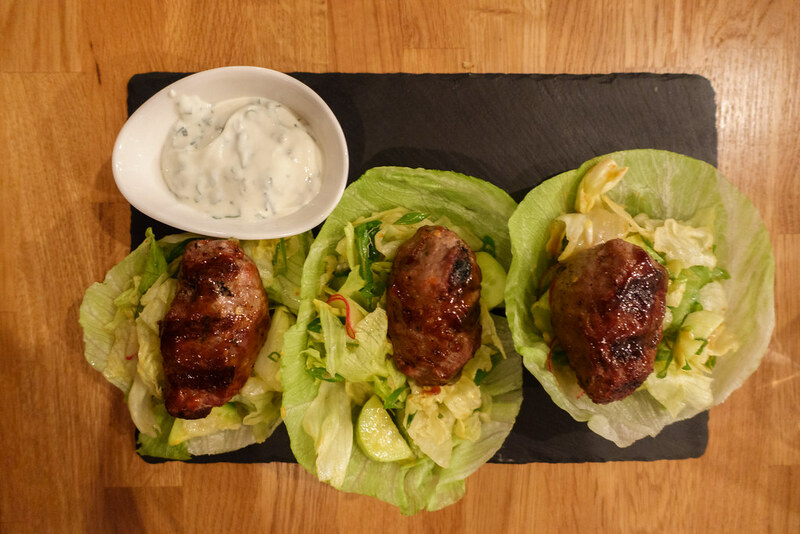 Steve had juicy meat kebabs in lettuce cups filled with zingy salad, accompanied by a yoghurt dip. Both looked as good as they tasted. 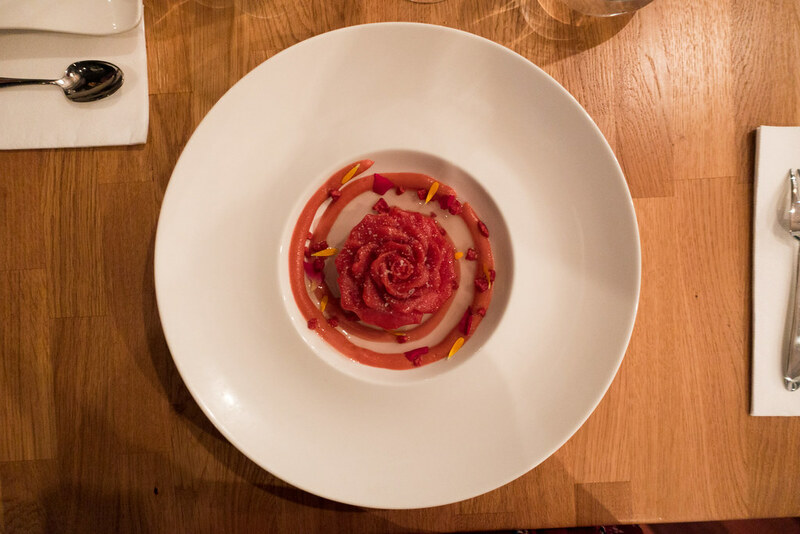 Dessert was less of a success for me: I had the restaurant’s trademark ‘Bulgarian rose’ in its third iteration, which was a rose-shaped strawberry and tomato sorbet. It was beautiful, but I found the tomato-flavoured sorbet just too weird! 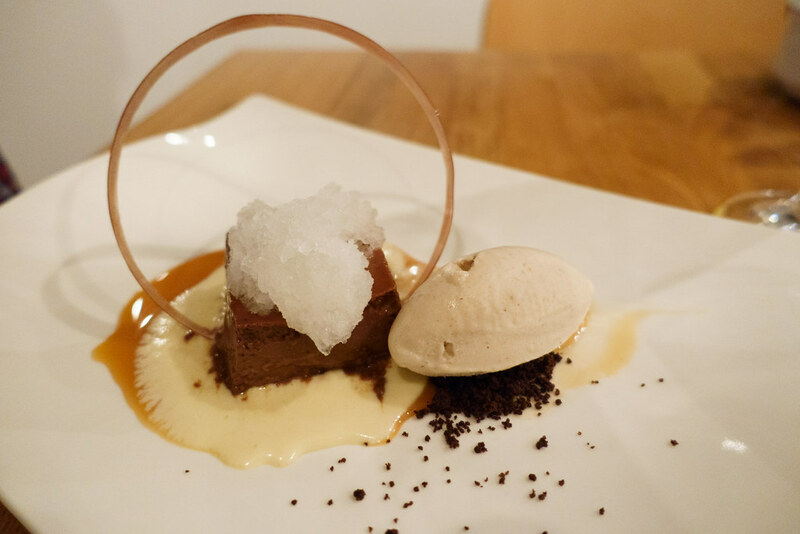 Steve’s dessert of ‘Chocolate caramel custard’, on the other hand, both looked and tasted gorgeous. We spent our last morning in Sofia at Mekitsa & Coffee, where you can order mekitsa with a vast choice of sweet and savoury toppings. 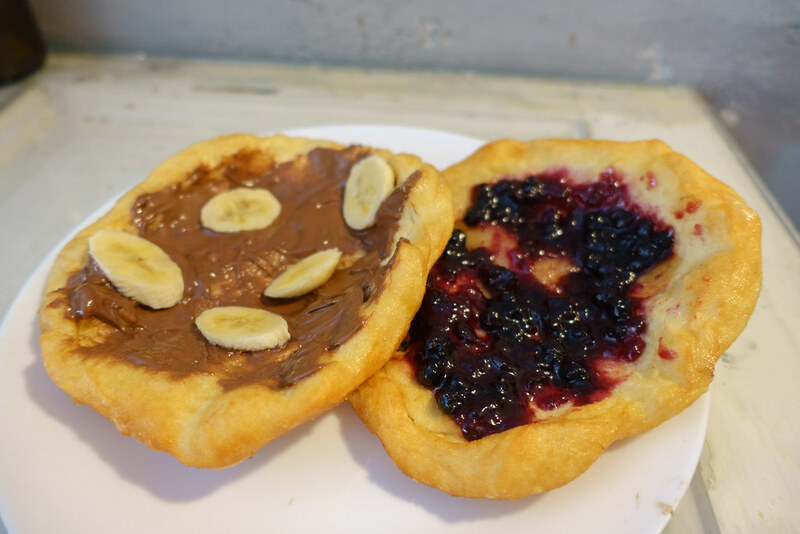 I went for one with blueberry jam, while Steve had two: one with feta and ham and another with Nutella and banana. We concluded that mekitsa makes an excellent breakfast after all, as long as it has a good topping! Posted in Bulgaria, Eastern Europe, TravelTagged boyana waterfall, Cosmos, mekitsi, Moma, Museum of Socialist Art, raketa rakia, SofiaBookmark the permalink.